SupportHelp for Interfolio ProductsHelp for Medical and Dental School Applicants Collecting Letters of RecommendationHow do I collect and send my letters? The first thing to do is sign up for a Dossier account. 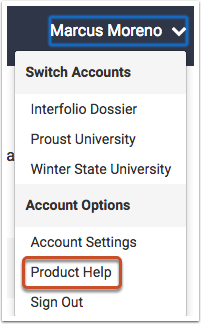 This will allow you to collect letters and other materials into your Dossier account. Once you are logged in and still would like step-by-step and more visual examples, click on your name in the top right corner and select the "Help" option. In order to send materials from your Dossier, including confidential letters, you need to upgrade to a Dossier Deliver account. Dossier Deliver gives you 50 deliveries in a an academic year for an annual subscription fee of $48. .
Once you have signed up for Dossier Deliver, you will need to complete a recommendation request form for each letter you'd like to submit. Log in to your account to begin requesting recommendations. Create a delivery to the school, and we will send your letter or attach it to your application once we receive it from your letter writer. Interfolio is FERPA compliant through our processes and procedures taken when handling of relevant documents. If you have any questions, please reach out to Scholar Services at help@interfolio.com for more information. Prev: How to: Add ID Numbers to My Delivery?